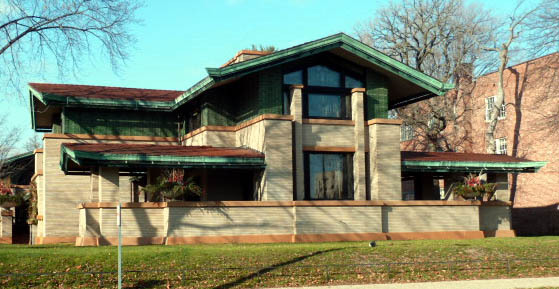 The best preserved and most complete of Frank Lloyd Wright’s Prairie houses, the 12,000 square foot Dana Thomas House is listed as an Illinois Historic Site and is now a house museum. Frank Lloyd Wright was commissioned to remodel an existing Italianate mansion on the site, essentially encasing the home and eliminating any trace of the original. Only a few remaining Italianate features are still visible inside. In the late 1980’s, the building was restored to its appearance in 1910. During a subsequent renovation, ACE was responsible for a comprehensive review of the building mechanical, fire alarm and security systems. The central plant chilled and hot water system in the Coach House and the single-coil fan coil units throughout the house were improved to provide simultaneous temperature and humidity control, preventing biological degradation of the building fabric over time. An additional set of pipes and new fan coil units were installed to accomplish this goal and a new DDC control system was installed to monitor and control all of the equipment and ensure that proper conditions are maintained throughout the structure. The existing combination security and fire alarm system was upgraded to enhance protection and improve reliability. Additionally, a new security camera system was put in place to monitor the outside of the building to deter vandalism, petty theft, and enhance security for visitors and staff.